The dense smokes and luscious whiffs of Shisha flurry freely in Dubai. These mouthwatering vestiges of Apple, Honey, Cinnamon, Blueberry, Mint or Strawberry can undeniably indulge you in a royal miasma. The Middle Eastern culture of Hookah is an critical component of routine life in Dubai. Hookah or Shisha shops in Dubai has been considered as a proclamation of majesty and royalty in Dubai for hundreds of years. However tourist and visitors; enjoy Shisha as a modish and stylish edict to vaporize flavored smoke. Hookah or Shisha shops in Dubai has also become a panache avowal that is particularly enjoyed by the youngsters. Like other fascinations, Dubai also has a plenty of Shisha bars, lounges, cafes and shops that offer the finest quality of Shisha and its accessories too. Non-smoker? No trouble. You can still enjoy the delectable Shisha zests at ultimate Shisha places in Dubai, even if you are not a smoker. Bursting scrumptious flavors and mesmerizing tang of Shisha is an ultimate pleasure. So when being in Dubai, don’t forget to wisp away these scrummy treats, because this is one of the most delightful dealing of the city. And if you feel that you are not sufficiently done; then buy one enchanting extravagance of these colorful and elegantly crafted Shisha’s and its accessories to take along with you, for your personal use or may be to gift your associates. Here are some of the famous Shisha shops in Dubai that will surely arouse your infatuation for a luscious flavored smoke. You can also buy Shisha or Hookah online in Dubai. We have hand-picked some of the best & popular Shisha, you can order in Dubai. Scroll to the bottom for more information. Below are some of the best Shisha deals available online in Dubai. Click on the image for more information & to order online. You can avail free delivery for these Shisha / Hookah products in Dubai & rest of United Arab Emirates. Smokers’ center is one the finest place to buy Shisha accessories in Dubai. The place offers you a wide selection of more than 3000 brands of cigarettes, tobacco, cigars and all other types of smoking accessories including Shisha. 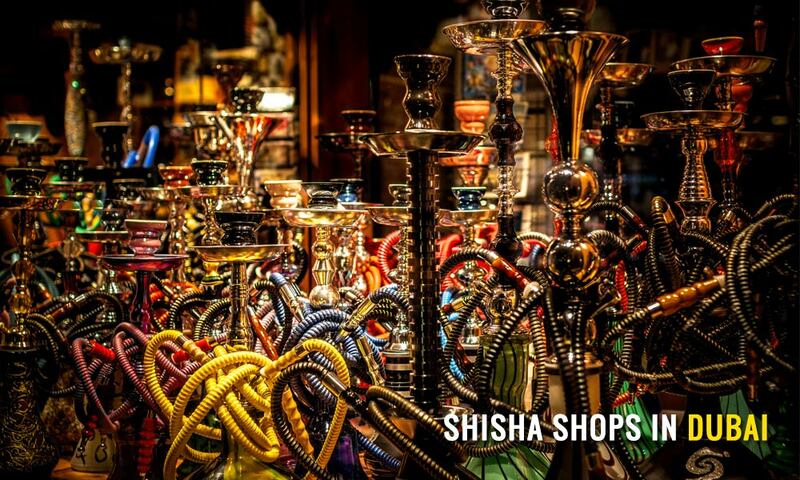 You may find her an extensive variety of Hookah bowls, hoses, bases, charcoal heaters, smoke enhancers, Shisha stems, valves & adapters, filters, foils, grommets, charcoal trays, lighters, hookah cleaning accessories, tobacco containers, wind covers, charcoal holders and much more. The place offers multi-brand product variety at affordable prices. Smokers’ center is located in exquisite Dubai Shopping Malls including The Dubai Mall, Ibn- Battuta Mall, Burjuman Centre and Mirdif City Centre. Those who are fond of buying Shisha accessories in Dubai are highly recommended to visit Bin Khumery Smoking Goods. The store gives you an overindulgence Shisha experience with its wide range of flavors, pipes and other accessories. Beautifully displayed in colorful packaging, the store is encumbered with hundreds of tobacco and Shisha brands and accessories. You may find different styles and types too for instance, if you are looking for authentic ornamental pieces and possess knowledge about Shisha types; then you may find here Khalil Mamoon, Classic Egyptian, Nammor, Mya, Dschinni glass Shisha, Shika, Anahi, Lavoo, Oduman, Roi, Regal, Sahara, Zahra, Fumo, Khanjar, Tonic etc. Bin Khumery is located beside the Capitol Hotel, on Al Meena road-Bur Dubai. Carrefour’s Hypermarket is also famous for selling affordable quality of Shisha accessories. If you are looking for reasonably priced Shisha accouterments, to buy as a souvenir or just to quench your eagerness; then Carrefour is the right place to go. You may discover a wide collection of reasonably priced Shisha stands, pipes, tobacco and all other smoke accessories here. You may also find Shisha bags. Learn more about Dubai Souvenirs that you can buy from Carrefour’s hypermarket. The Carrefour hypermarket that is located in the Mall of Emirates offer you this array. The Murdef Star Smoking Centre is specifically famous for dokha and medwakhs, tobacco and flavors. This store is recommended if you are precisely looking to buy quality flavored tobacco to refill your stock. The Murdef Star Smoking Centre is located near Mirdif City Center. The store offers you great product quality at relatively lower prices than those offered in malls. Mohammad Mohammadi Smoking Accessories could be an alternative choice for Carrefour’s Hypermarket and Murdef Star Smoking Centre. This shop also has an inclusive multi-brand variety of Shisha and smoking accessories. You may select from a wide selection of hookah pipes, flavors, bowls, funnels, etc. This store is located on Al Badia Blvd Dubai. The store tends to satisfy all your smoking needs as they sell a brand assortment of Medouakh, Cigarettes and Shisha along with numerous accessories and flavored tobaccos. These are some of the recommended Hookah & Shisha shops in Dubai. If you would like to recommend a Shisha shop in Dubai, please do so by adding comments below. Where can i buy original Arabic shisha tobacco ? The one shop I knew near fish round about is closed . They used to sell it from jars !!!! AL BAIT AL FAKHER SMOKING ACCESSORIES in sharjah had newest blends of dokha at affordable price.. you must try! Where can I buy a Khalil mamoon in Dubai?